Use your google-fu to see what a crostata pastry is supposed to look like before you get started, folding it into pretty edges is harder than it looks. Pre-heat oven to 218°C / 425°F. Use centre rack. Use your favourite pie crust recipe; roll it flat, place on cookie sheet. 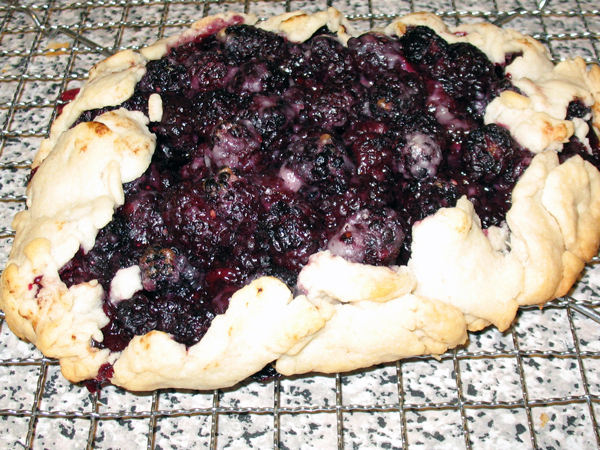 Place filling on crust, stopping about 2-3″ from the edge. Fold the crust up and over the edge of the fruit pile. Cool at least 20 min before consuming.